We’re driving to beautiful Santa Cruz, California. 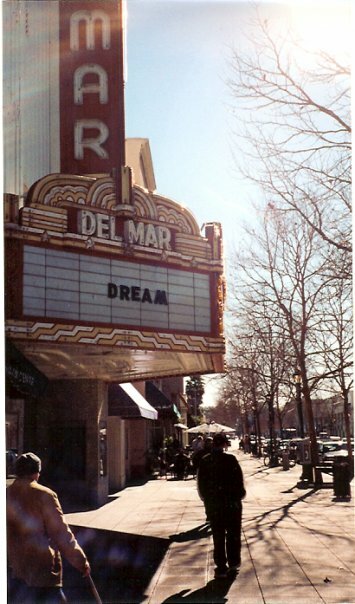 This photo of its Del Mar theater captures some of the deep magic that I feel there. I took it while wandering downtown in the early 2000s, another wide-eyed UCSC college kid dreaming about the future. Fifteen years and many countries later, it fills me with joy to be returning to Santa Cruz. Artist Sarah Louis Bianco has invited me to be Apricity Gallery’s first magician in residence. We’ve been talking about and planning art, magic, and music based on the theme of Enchantment for years. This week we get to build, create, and, finally, perform this show with artists from many disciplines. Here we go . . . back to the Del Mar . . . back to the beaches and the redwood trails . . . back to that dreamplace: Santa Cruz.